The American Lieutenant in charge of documenting Buchenwald (where the shrunken heads came from) was from the Psychological Warfare Division of the Allied Forces. Albert G. Rosenberg was Jewish, born and raised in Germany. He had recently become an American. "Psychological Warfare Division." That's a strange name for a department that's going to document a concentration camp for future generations isn't it? The Lieutenant in the PWD was Albert G. Rosenberg. Even though he was only in his late 20's at the time, he had a rare special pass called a "SHAEF Pass", which gave him the power to confiscate the posh villa belonging to Baldur Von Schirach, who had been the wartime mayor of Vienna and also the leader of the Hitler Youth. Rosenberg lived in the villa with 12-15 former Buchenwald inmates and the team wrote-up a documentation of the camp. Most of the former inmates were communists, led by a non-communist Austrian Catholic named Eugen Kogon. Kogon compiled the report while Albert Rosenberg supervised the overall project. One could say that the documentation of Buchenwald is largely a story of liberated communists working in a posh villa, under the supervision of a Jewish Psychological Warfare Division Lieutenant who had emigrated to the USA from Germany just seven years earlier. Objectivity you can count on. After this project, Albert Rosenberg confiscated a German suburban house for Eugen Kogon and his family to live in, so that Kogon could write a book on his personal experiences at Buchenwald. The Psychological Warfare Division, which by now had made the Orwellian move to change it's name to "Information Control" wanted this book to be read by the German population. The book, called "Der SS-Staat, is still the standard work for Buchenwald. In my June 2007, 2-hour phone conversation with the elderly Albert G. Rosenberg, he told me that Kogon could have become Chancellor of Germany instead of Konrad Adenaur, (something about Kogon knowing a "Cardinal Pacelli" and how that was a good thing.) but one was more right and the other more center, and Adenauer ended up becoming Chancellor. Months later out of curiosity I looked up Cardinal Pacelli on Wikipedia and saw he became Pope Pius XII in 1939. That would have been interesting though: Psych Warfare changes it's name to "Information Control" and promotes Kogon to become the head of Modernist Germany. It would have been 1984 in 1954. 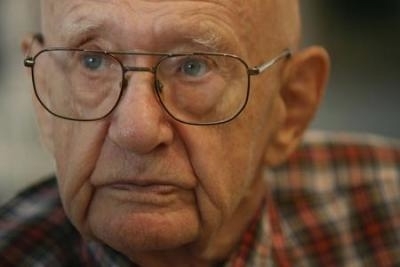 El Paso man collected evidence at Nazi concentration camp Buchenwald Rosenberg never learned whether the Buchenwald report was declassified. But he learned that the original copy of the report was kept at a National Archives depository in Virginia, in box 149, before a fire in the 1970s destroyed it. All copies of the report were thought to have disappeared until Rosenberg resurfaced with his. In 1995, the testimonies and evidence he collected were translated from German to English and published in a book,,"The Buchenwald Report," by David Hackett. 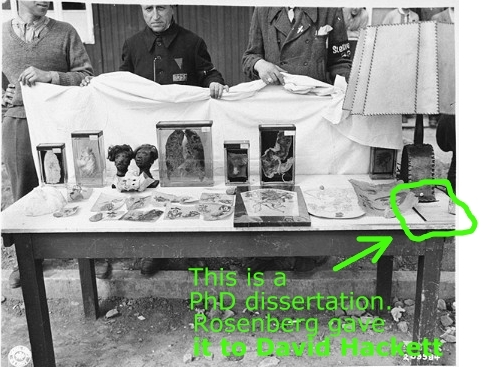 To my knowledge, every item on the Buchenwald table is now missing except the PhD dissertation, and that's because Albert G. Rosenberg took it home with him. Karl Koch trial judgment and transcript have disappeared. But consider that the dissertation is a piece of withheld evidence. Ilse Koch's lawyers would have liked to have known about it. Afterall, it could have helped exonerate Koch from the incredibly cruel charges that she made lampshades out of human skin. Her lawyers could have offered an alternate explanation, using the dissertation to bolster the notion that tattooed skin was at the camp because a student had been studying the skin. Similarly, the Nuremberg defendants' lawyers would have also wanted to see it, since they could have used it to offer an explanation as to why tattooed skin was found at Buchenwald. The Germans' lawyers probably never knew the dissertation existed.